You might be here for inspiration. You might be here for empowerment. You might be here for…something else. In any case, we’re bringing the heat on some top-notch games and apps. Aside from being great, they have one more thing in common—they were designed by women. 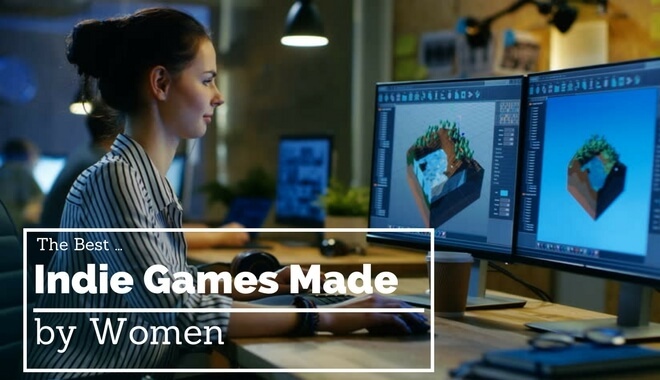 Less than a quarter of game makers in the industry are women. About 50 years ago…there was one woman designing games. It’s amazing to think there was a time when only one woman was working in the industry—but it’s also amazing to think about how less than 25% of the industry workforce are female after half a century. As we continue to fight the good fight for equality, liberty, and video game-induced happiness for all, it’s worth taking a look at some of the great games and apps that have come out over the years—specifically games and apps designed by women. This is a history lesson, an education session, a celebration of achievement (against extra adversity), and an empowerment of all people to stand up for what’s right and to follow their dreams, no matter the roadblocks. They’re not great for games and apps designed by women. They’re great games and apps period—And they’re designed by women. Time to learn a thing or two about game design! That’s right, the first “best” game is actually a two-for-one deal. It’s a twofer because Speedway didn’t take up all the room on the cartridge, and Tag didn’t warrant its own cartridge. A twofer is born. Synergy. This game combo gets recognition because its designer was a real trailblazer—for women and the industry. These games were created by Joyce Weisbecker back in the late 1960s (1967 to be exact). Joyce’s father worked for RCA at the time. At a time when computers could cost $6,000-$25,000 dollars, Joyce’s father managed to build his own computer, called FRED, in his basement. Long story short, RCA pulled from the FRED design and built their own version of the home computer—for which they wanted some games. She’d been encouraged by her father to program on the family computer from a young age. While she was home on break from college, he asked her if she wanted to make a game for RCA. One thing led to another, and Joyce put together these two games. But she wasn’t an employee of RCA—she was contracted to do this work. This means she was the first woman to design games, and also the first female indie game developer (the first female video game designer credit is widely misattributed to Carol Shaw with her 3D Tic-Tac-Toe release for the Atari 2600—also impressive, just inaccurate, as that came after Speedway—Tag). Speedway is a racing game, where player one controls a white rectangle and player two controls a white rectangle with a black dot in the middle. You raced each other around a simple track. Graphics have come a long way. Tag was simply two dots. Whoever was “it” had to get their square dot to touch the other player’s square dot. Every tag was worth 10 points. Centipede was a smash-hit arcade game that debuted in 1980. If you haven’t played it, you basically dodge and shoot bugs (gamers are spoiled these days). But it’s true. The titular centipede winds its way down from the top of the screen, and it’s up to you to shoot away all its body segments. The whole time you’re dodging spiders, scorpions, and other bugs. Dona Bailey designed this winner of a game (along with Ed Logg), but left the industry for 26 years after its release—”it was the pressure and criticism from her male counterparts which drove her from the business.” But not before she could leave her mark by inspiring future games for decades to come. You can grab it for $14.99 on Steam (where it has received very positive reviews). It’s a game that doesn’t have the typical challenges of issuing death unto others while avoiding it yourself—it’s “just hours of blissing out to buttery-smooth gravity goodness.” Which sounds like a nice break from a crazy world. Ivy Games is the indie game label behind Gravity Ghost. And Erin Robinson is the indie video game developer behind Ivy Games. She’s been developing games since 2005, and teaches and speaks publicly as well. Her games can be innovative, introspective, and influential. This list is game-heavy, but we do want to mention this app. Roni Frank (and her husband Oren) are the masterminds behind this app. You start by chatting with a “matching therapist to identify your therapy needs.” Plans start for as low as $32 per week—once you select your plan, Talkspace will match you with the therapist that best fits your needs. The app guarantees 1-2 responses per day from your therapist (and you can message them at any time)—there’s also the option to schedule a video chat for longer talks. In a crazy world where it’s easy to lose hope or even just feel overwhelmed, having anytime-access to professional, judgment-free help can be life-changing. Portal is a super fun puzzle game from Valve…but the idea for Portal started as a different game: Narbacular Drop. Kim Swift designed Narbacular Drop with help from fellow DigiPen graduates. The Narbacular Drop gameplay mechanics are based on portals. And, if you watch the Narbacular Drop gameplay, the similarities between it and Portal are very apparent (even the portal colors are similar). After getting wind of Narbacular Drop, Valve hired Swift and co. to bring Portal to life—and they certainly did, with great success. Portal involves solving a number of puzzles using—you guessed it—portals! Your character has a portal gun which can create and sustain two portals at one time. You just aim at a solid surface and shoot. This leads to some trippy puzzles that involve everything from capitalizing on gravity to calling on companion cubes. The industry goes crazy over Swift, and Forbes named her a top 30 under 30 in the games and apps industry. OK, that’s right, Loopin’ Louie is your bonus. It’s a board game, you see. There’s a crazy man (named Louie) who flies his airplane in a circle (Louie’s plane is attached to an arm which is attached to a motorized base). The problem here is, your chicken farm is directly in Louie’s flight path! You and three other players have to use your paddle to knock Louie and his plane up and over your chickens. If he hits your chickens three times, you lose. Carol Wiseley is the mastermind behind this game. Without her, my childhood, my friendships, and my plane-paddling skills would be profoundly different.